Ok, you know me, use what I have - so tried this recipe with cod. Results - definite keeper! Oh, and that 40 minute prep time, the garlic is doing all the work (roasting), not you. 1. Preheat oven 375ºF. Coat a baking dish with cooking spray. 3. Remove garlic from foil and squeeze roasted garlic cloves out of husk into a small bowl. Add 1 tsp olive oil and blend well. 4. Place fish on baking dish coated with cooking spray. Spread roasted garlic evenly over each fillet. Sprinkle each fillet evenly with Parmesan cheese and season with paprika, pepper and salt (optional). 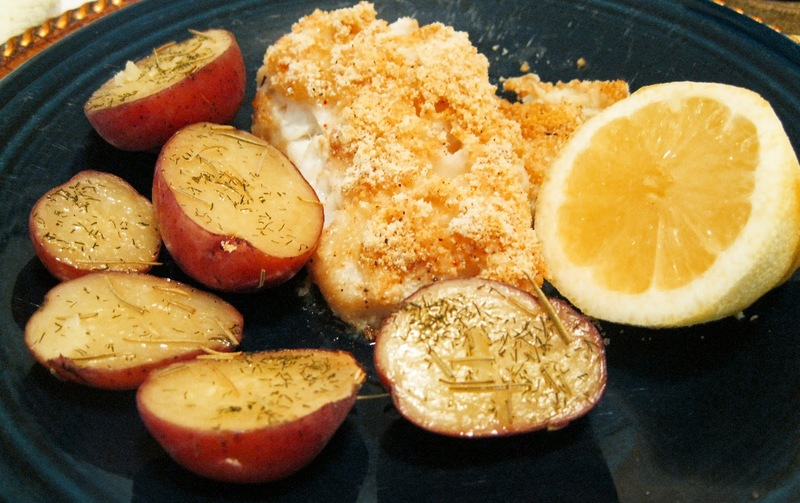 I think you could use cod, whitefish, snapper and yes, even orange roughy with this recipe. First time roasting garlic. Talk about easy, as well as a fragrant aroma throughout the house (that is, as long as you like garlic). And as for removing the cloves, it is as easy as the recipe says - you just squeeze the bulb and out they come. Ok, I mixed the parmesan cheese, paprika, pepper and a very small amount of salt together. It's all going on the fish so why not make it easier? Because my fish was still partially frozen, it took about 10 minutes longer in the cooking time. As for the potatoes: I placed the cut halves on foil, drizzled a little olive oil, rosemary, dill & coarse salt on them. Sealed the foil, put them in the oven the same time I put the garlic in and voilà, they were ready the same time the fish was done.